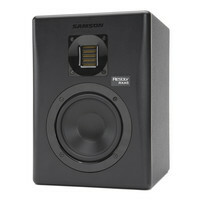 The Samson Resolv RXA5 is a two-way active studio monitor that offers a flat frequency response and professional audio quality for precise mixing and mastering in your studio. The RXA6 features a 5″ copolymer woofer speaker and 2.5″ aluminium ribbon tweeter putting out 100 watts of power. The Samson Resolv RXA5 is perfect for many applications in particular electronic music production. This entry was posted in Samson and tagged Recording-and-Computers. Bookmark the permalink.